You’ll find friendly staff and great food at Monty’s Blue Plate Diner. Monty’s Blue Plate Diner is an moderately priced 1950s-style diner offering comfort food, including Charbroiled hamburgers, fries, and shakes plus gluten-free, vegetarian & vegan options. Located in a blue and white retro gas station-turned diner, this restaurant is a Madison tradition. 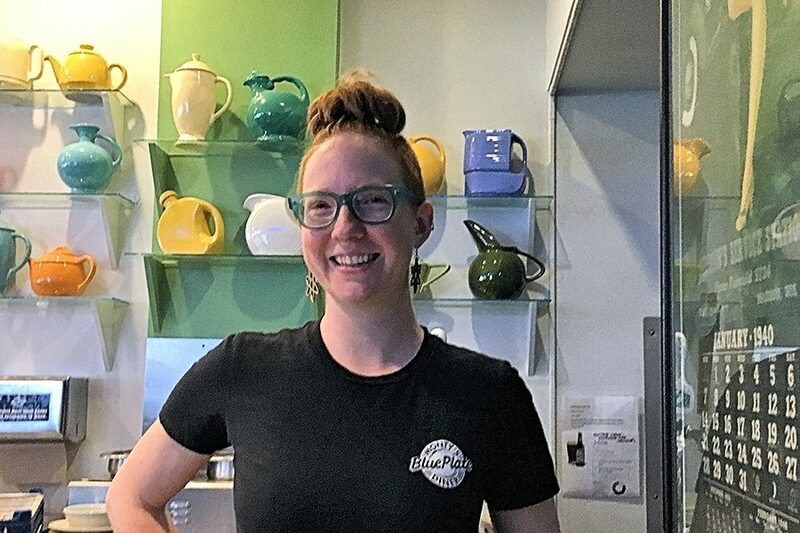 Featured in Madison Magazine’s “Best of Madison” for 2019, this is classic American diner chow with the added bonus of tasty, homemade cakes, pies, and other bakery items. This Atwood neighborhood gem boasts a delicious menu, with a little something for everyone. Monty’s is a modern marvel: a place where dedicated carnivores and true vegans may dine together in perfect harmony and all leave happy and satisfied. While there is no nutritional menu available, there is a special section on the menu where Vegan, Vegetarian, and Gluten-free options are offered. It’s easy to see why these menu items are so popular. They offer a variety of creative options not often found locally. Speaking of “not found locally,” Monty’s Blue Plate Diner has beer, ice cream cocktails such as Mudslides, several varieties of Bloody Mary drinks, and Mimosas available along with breakfast, all day long. Known for their generous portions, Monty’s Blue Plate Diner is a great value, especially for hungry college students. The friendly staff and comfortable interior make dining there a pleasure. Whether stopping in for breakfast, lunch, dinner or dessert, this is a friendly space that manages a balance between homey and hip. Everything except alcohol is available for take-out. When I visited on March 30, I tried the Biscuits and Gravy. The homemade biscuits were every bit as good as my grandmother used to make and they were deliciously clothed in a rich, creamy gravy with just enough pepper to be memorable. The scrambled eggs were fluffy and well prepared. The potatoes were a nice surprise. Golden brown slices of tender potato seem to have been pre-cooked and then grilled just prior to serving which made them tender and crispy all at the same time. The Hot Fudge Brownie Sundae is even better than it sounds. Furthermore, it was absolutely huge. My companion and I shared it and still had some to take home. What more can I say? The food is delicious, the coffee is hot and fresh and whatever goodies you might imagine could be found in a great diner are all here and then some.